The Warrington-born lock moved from Wasps to Leicester for the 2010-11 season in pursuit of more England recognition. 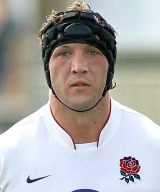 He captained England Saxons in 2010 including games in their victorious Churchill Cup campaign. Skivington played 132 games for Wasps after debuting in 2003 before deciding that a move to Leicester, where he replaced the retired Ben Kay, was a move he wanted to make. Nicknamed 'Gorgeous' by colleagues the lock has earned a reputation hard work and honesty. He joined Wasps from the Saracens Academy after attending Wimbledon College and John Fisher School, Purley. He started to make his way up the club's teams. Skivington made his first team debut against Stade Francais in a 2003 pre-season friendly.